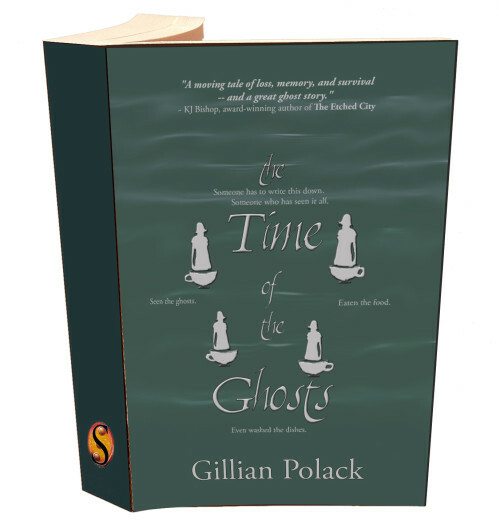 I interviewed Gillian Polack as she celebrates soon the release of her new book The Time of the Ghosts. Someone has to write this down. Someone who has seen it all. A fairy – variety melusine – tells of her private ghosts in unreliable fairy stories. She handles her own haunting. Some years our fears and hates are so strong that we turn our ghosts tangible. Instead of trailing after us forlornly, whispering “Believe in us, or you are damned,” they fracture our landscape. Poltergeists and the spirits of drowned girls; malicious presences and portents; cat vampires and roaming bushrangers. These ghosts haunt Canberra. These ghosts can kill. It takes four women, one cup of tea at a time, to deal with Canberra’s haunting. 1) – I was reading Mary Victoria’s interview with you and saw that you went to Aussie Con! I can’t believe I missed out on meeting you in the flesh at World Con in Melbourne. Where were you hiding yourself? I live in Canberra. I’m younger than most of my characters in The Time of the Ghosts, but old enough so that five year olds hug me sympathetically for being so old (five year old friends are very sympathetic towards middle age – they also laugh at my jokes). I enjoy cooking, chatting with friends, most things to do with science fiction and fantasy, being a historian, being a writer, teaching and research. I do not enjoy housework. 3) – Can you describe your new book in three words? 4) – What is the basic premise of your latest book? The Time of the Ghosts has two premises. The first is that elderly women can do exciting things without the rest of society knowing because we tend to leave them to themselves a lot of the time. This is why my novel contains superheroes who are female and beyond menopause. Two of them are very far beyond menopause. The second is that the fears and hopes and despair we carry can manifest themselves and can be really, really dangerous. 5) – Who was the worst character to write and why? The worst character was Ann. She’s a nice person going through very hard times and I wanted to talk about them and show how nice she was. Instead all the less charming bits of her showed because of what she was going through. She’s your next best friend, really. It’s just that many of us are our worst selves when life goes wrong. Ann wants to be as extraordinary as her best friends and thinks she’s a failure. We’re not seeing the thirty years when she was there for everyone, but the few months when she lost herself. 6) – Tell me more about Little My. Where did it come from and why? Little My is a character from Tove Jansson’s Moomin books. I went to Finland last year as part of my GUFF experience (I was representing Australasia at the world SF convention and got to meet fans in England, Ireland, Finland and Croatia as part of this) and I came back supporting the world convention in 2017. The convention organisers gave me a Little My soon after. When I visited Sydney, I gave her some adventures. Then there was a science fiction convention in Canberra and she had some adventures there. She absconded on the last day (to the disappointment of fans who wanted their picture taken with her) and was last seen flying over the Northern Territory. You can follow her adventures by looking me (Gillian Polack) up on Facebook and going to my photo albums. Little My is very social and got to know a lot of writers during her adventures, so you may well find pictures of her with your favourite writer. I remember she posed with Isobelle Carmody, for example, and scared Sean Williams. 7) – Why should people buy this new book? Because it’s a lot of fun and just a little scary. Because the food side of it is amazing and I want to attend all those dinner parties myself. Because it will make you look at little old ladies with a lot more respect. Because it’s not the Canberra everyone thinks they know. 8) – How many more books have you got coming out this year? None! I had three and they’re all out!! The three were The Art of Effective Dreaming (a novel about making dreams come true), The Middle Ages Unlocked (written with Katrin Kania – loads of useful stuff about medieval England) and The Time of the Ghosts. I have another three coming out next year. Two novels and a non-fiction book again. I had a huge backlog of books sitting in various publishers’ in-trays and they were all signed up at once and are now magically appearing. I don’t actually write three books a year. I write about one every two years. What’s emerging now is fifteen years of very hard work. 9) – What is your favourite flavour of ice cream? Chocolate. Dark and rich and streaked with other flavours. 10) – Lastly, what inspired The Time of the Ghosts? I was giving a lecture on the Middle Ages to a huge crowd of elderly women. One of them was my mother. I had a sudden idea and asked them (after the lecture) whether their families knew just how much they did with their lives. No. It turned out that they asked their families what they did, but their families assumed that their elderly parents/grandparents lived in a kind of limbo, waiting for younger people to turn up and tell them about living. I asked my mother on the way home (she drove) if she wanted to be a super hero or a villain. At that moment I started planning a novel. If enough people buy it, I’ll write another one. Elderly women make the best protagonists. Dark secrets and long lives and strong opinions!